Your favorite slipper pattern and yarn. For this tutorial I have used the Oma House Slippers by Tara Murray and have modified the toe just by adding a few front post stitches. She also has other great slipper pattern that will work great for this method! You’ll want to pick a pattern that starts at the sole so you can make a second sole (you’ll see what I mean in a minute). Plasti Dip spray. I find this at my local big box home improvement store for around $6 by the spray paint. You can also find it HERE on Amazon. They also make a paint on plasti-dip. I’ve tried this and I think it’s a little easier to control but it’s harder to add an even layer. Cardboard. This is to protect the surface you will be spraying on. I’ve used a cereal box. Painters tape. I was out of this for the tutorial so I just used masking tape which works fine but the low tack painters tape is best. Zip top bags or something to protect the yarn when you spray the plasti-dip. Make your slippers. Finish them off like you would normally. Set the slippers aside. Make a second pair of soles (only follow your pattern directions for the soles). Fasten off your yarn leaving a long enough tail to slip stitch the second sole onto the bottom of your slippers. I don’t like guessing here so I usually slip stitch the sole onto the slipper first and undo it just to be sure I have enough yarn. You could also fasten off here an just join a new piece of yarn when stitching the soles on the slipper but that means more ends to weave in. Roll your excess yarn into a ball and place it in the zip top bag. Use your masking tape (or painters tape) to cover the yarn sticking out of the bag to protect it from the spray. You may not want to use as much tape as I did (for some reason I went a bit overboard). Just enough tape to protect the yarn from the spray. Take your soles outside or to a well ventilated area. I take mine out to the garage because it’s usually raining when I want to spray slippers. Place the soles on the cardboard with the bottoms facing up. Following the directions on the plasti dip can and spray the bottom of the soles. I do 2-3 coats letting each coat dry about 4 hours before applying the next (this is the part that takes the longest). I let my final coat dry at least 24 hours because we live in a pretty humid climate. After it dries it may not feel like much. You may think you need more coats but believe me it’s not necessary. Remove the tape and zip top bag. At this point I like to loosen up the plasti-dip on the bottoms by pulling on them. 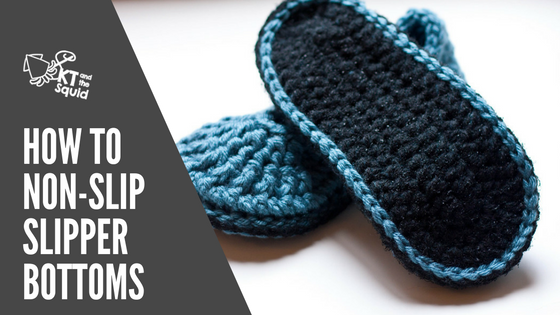 Slip stitch your non-slip slipper bottom to the bottom of your slipper. I find that an aluminum hook works best here. You may not think it will work but you’ll be surprised how easily the hook glides through the plasti dip (I was the first time I tried this). Finish off with an invisible join. I just love these slippers! They look professionally made but they are SO easy to do! Hope you like them too. If you have any questions feel free to ask.